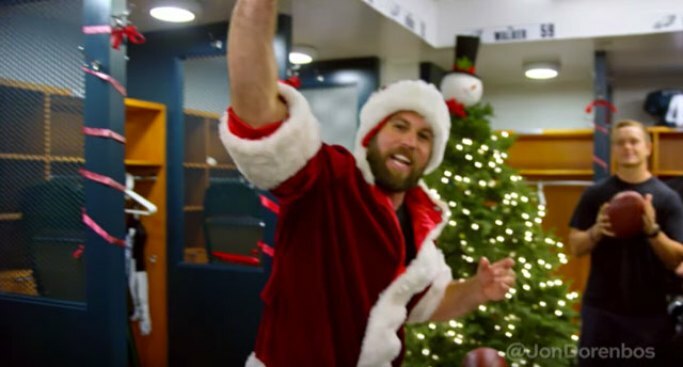 You'd think wearing a Santa Claus costume around the Philadelphia Eagles could be a risky endeavor but Jon Dorenbos isn't afraid of much. The Magic Man's season may have been cut short due to injury but that hasn't stopped him from doing his thing for an America's Got Talent holiday special that aired on Monday night. Dorenbos was a fan favorite this past season on AGT so it make sense they'd bring him back to spread a little more cheer. Eagles fans could certainly use it. He attempts to explain a Christmas-y type theme to the trick involving four guys named Jack. Tough to follow, but he makes cards do weird things, so that's cool.